Most North Americans had never heard of a heated towel warmer. In Europe, they're almost as common in people's homes as a toaster would be in Canada. The heated towel warmer and drying rack is an energy-efficient addition to your home, helping both the environment and your budget. The heated towel warmer and drying rack uses less energy than most standard light bulbs and can be run 24 hours a day, 7 days a week. 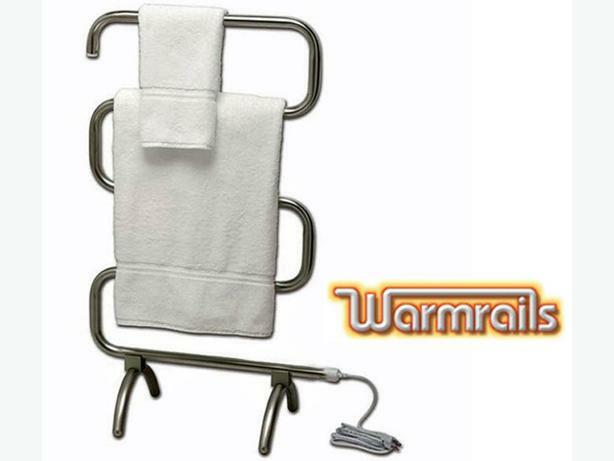 It is far easier and much more cost-effective to run a heated towel warmer and drying rack than a full sized dryer. Keeps your towels dry, warm, and fresh all year long! This will help turn your ordinary bathroom into the ultimate luxury/spa experience. Really helps draw moisture away during the hot and humid months. Keeps your towels from smelling musty. Also helps eliminate mold and mildew growth. Great for drying delicates, hand washables, swimsuits and warming baby blankets and bedding. Used, but in great condition.